There are plenty of good reasons to choose Pedego, but the best reason is impossible to put into words… It’s the way you feel when you ride a Pedego. Once you try one, you’ll know in an instant why those who compare, choose Pedego. But then we felt guilty because it was so unfair to them. No other brand can possibly compare to Pedego! Pedal assist systems sense your pedaling and provide assistance automatically. They’re most popular among experienced cyclists that want a more natural, “bike-like” riding experience. Pedal assist is also nice for long rides with few stops. You can just relax and enjoy the ride without holding a throttle in place. In the United States, we have the luxury of using throttles on our electric bikes, which are forbidden in Europe. Throttles provide full power on demand and Americans love them because they give us complete control. They’re especially helpful for getting started from a standstill (sometimes it can be awkward to gain momentum), getting a quick burst of power to climb a hill, or safely getting through an intersection. If you can’t pedal, or you just don’t feel like it, that’s okay too. We’re not judging! Most Pedegos have both pedal assist and throttle because that’s what most people want. The only exceptions are entry-level bikes that don’t include pedal assist, and certain mid drive motors that aren’t available with throttle. In general, Pedego believes in letting you decide for yourself how you want to ride. Even if you prefer one over the other, why wouldn’t you want the option of using both? Pedego offers both options, so we have no ax to grind. Our philosophy is the best electric bike is the one that’s the most fun, for you personally, to ride – regardless of the motor. A majority of electric bikes in the U.S. have hub motors. By and large, Americans prefer them because they are simple and easy to use. They seamlessly deliver power right where it’s needed, without any extra gear shifting or wear on the drivetrain. Every Pedego with a hub motor includes a twist-and-go throttle. Hub motors are also admired for their breathtaking performance. 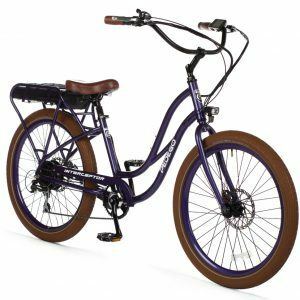 Most Pedegos sports a 500 watt hub motor with twice the power of a typical mid drive. You can feel the difference! While mid drives aren’t as common, there are things they’re ideally suited for. The Pedego Elevate is made for seasoned mountain bikers. Its weight is lower and more centered, and the gears of the bike can be leveraged to navigate off-road terrrain. The Pedego Conveyor is a bicycle commuter’s dream. It’s equipped with a belt drive and internally geared hub that are useful for everyday riding. The Pedego City Commuter: Mid Drive Edition excels in areas with very long and/or steep hills. Its 500 watt motor has twice the power of a typical mid drive, and it features an exclusive twist-and-go throttle. For everyday riding conditions, the obvious place for the battery is the rear rack. 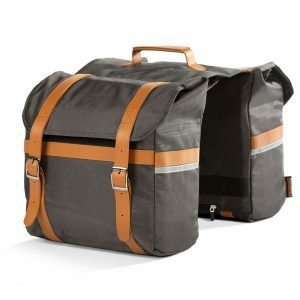 It’s the most convenient and logical way to carry extra weight on any bike. That’s why bicycle commuters usually carry their stuff on the rear rack. It just makes sense. Some avid cyclists prefer to have the weight of the battery more evenly distributed on the bike with a lower center of gravity — especially for off-roading. Pedego offers both options, and the difference is hardly noticeable for most people. For casual riding, or commuting on typical streets and paths, it’s six in one hand, half a dozen in the other. Heavy-duty wheels made of a special magnesium allow larger rides to safely enjoy Pedego-ing. They are maintenance free because there are no spokes to replace or adjust. Proprietary software that provides the ideal riding experience. Each model is programmed based on a number of factors that make it unique. Riding a Pedego connects you to mother nature and the people you care about. Now, you can also connect with Bluetooth! *Note: Currently unavailable on Stretch, Trike, and Ford models. The Elevate uses a different bluetooth connected app from Shimano. Most Pedego Electric Bikes feature a convenient USB port to charge your phone and other devices on the go. It’s just one more way we’re thinking of you and improving your riding experience. A Pedego store is like heaven when you’re shopping for an electric bike. The experience is unmatched anywhere on Earth. Pedego store owners have been in your shoes. They usually start out as customers who fall in love with Pedego Electric Bikes and open a store to share their passion with you. You’ll never find a more hardworking, fun-loving group of people, and they’re at your service. They put their hearts into helping you find the perfect electric bike, and making sure you get the most out of it. When you walk into a Pedego store, you’ll find a welcoming and comfortable atmosphere where you’ll be treated like family. Come as you are! When comparing different brands of electric bikes, it's wise to use watt-hours instead of estimated range. Generally speaking, any Pedego battery should last longer than you want to ride. Your fanny will probably quit long before your battery does! With that said, this can be a tough question because there isn’t one “standard” way to estimate range. So we’ll go over some simple math that can help you predict the range of any electric bike. All batteries have both a voltage and amp-hour rating. If you multiply the two together, you get watt-hours. Watt-hours is an objective measurement of the actual amount of energy stored in any battery. Estimating your actual range is a little more tricky because there are so many variables. On average, you can expect to use between 12-24 watt-hours per mile. This number fluctuates so much because of differences in terrain, rider weight, weather, speed, and most importantly how much you pedal. You can expect your battery to last about 2-4 years. All Pedego batteries come with a smart charger and advanced battery management software, including an automatic “sleep mode,” that help them live long and happy lives. They are guaranteed by an industry-leading two year warranty. Lithium batteries rarely stop working altogether. They gradually lose their capacity over time. Since most Pedego owners have tons of excess capacity, it can be many years before a replacement is needed. A battery will charge in between 2-6 hours with a standard wall outlet. It uses very little energy – usually about ten cents worth. And it includes a smart charger that will automatically shut off when it’s done. Pedego batteries are made up of individual Li-ion cells designated 18650 because of their size (18mm x 65mm). These are very common batteries found in countless consumer electronics, electric bicycles, and even electric cars. There are basically two types of 18650 cells- those made by reputable, name brand suppliers, and everything else. The name brand cells are naturally much more safe and reliable than cheaper cells. Of course, Pedego Electric Bikes always uses premium cells made by name brand suppliers. The battery is charged by plugging it into the wall, and the more you pedal the farther you can go. Your pedaling conserves the battery, but it doesn’t actually charge it. The technology does exist that would allow you to charge your bike by pedaling, but it’s expensive and we’ve found that it just doesn’t make sense in the real world. The main problem is that it makes it hard to pedal, and that’s not fun! Even under the most ideal conditions, like riding downhill, the amount of energy you would get back is very small. When you invest in a Pedego Electric Bike, you’ll enjoy the peace of mind of an industry leading two year warranty, including parts and labor. We like to call it our “no excuses” promise to you. Of course, a warranty is only as good as the company behind it. We’ve seen hundreds of companies selling cheap electric bikes come and go – leaving unhappy customers behind. Pedego, on the other hand, has a rock-solid reputation for world-class customer care. Even the finest products on Earth (like Pedegos) are bound to have an occasional flaw that needs to be resolved. That’s why our team of experts are just a call or click away. We see every warranty issue, no matter how small, as an opportunity to show you how much we care. You’ll probably never need our help, but it’s nice to know that Pedego is always here for you. Since April 1st, 2018, the Pedego warranty includes a generous anti-theft protection plan. A stolen Pedego will be replaced for free under certain conditions. Pedego offers a strong folding lock that conveniently attaches to your bike. This solid, hardened-steel lock, with drill protected rivets, is designed to keep your Pedego bike out of the hands of bicycle thieves. The battery can be locked in place or easily removed and taken with you. Check with your homeowner’s insurance policy to see if your Pedego is covered. If not, there is supplemental insurance available through third party carriers. Just imagine all the fun adventures you can have traveling with your Pedego. It’s the best way to explore a new area! The Latch is especially good for travel because it easily folds in seconds. Otherwise, most Pedego models can easily be carried on most standard hitch mounted vehicle racks. Thule is our favorite brand. The Tandem and Trike are the most challenging models to travel with, but it is possible. Your local Pedego dealer can help you choose a good option. The Pedego Owners Group (POG) is a thriving community of fun lovers just like you. It makes it easy to connect with each other by going on group rides, attending fun events, and sharing stories and advice. Lifetime membership is free, and you’ll get a fun gift just for registering. You can also request free collectible Mile Marker pins to track your miles. Aside from keeping your battery charged, maintaining a Pedego Electric Bike is the same as any bicycle. After the bike’s been ridden about 100 miles you’ll need a basic tune-up. This is standard procedure for all new bikes as they’re broken in. The most important (and simple) thing you can do is check your tire pressure regularly, and keep them inflated as indicated on the tire. If you’re riding in wet conditions, you’ll want to take extra care and make sure you keep your chain (or belt) clean and the chain well-lubricated. Other than that, you’re likely to need minor adjustments from time to time, and even the best parts do eventually wear out. We suggest that you bring it in for a check-up at least once or twice a year to ensure the most safe and pleasant riding experience. Federal law defines an electric bike as a two or three wheeled vehicle with fully operable pedals, a top speed when powered solely by the motor under 20 MPH and an electric motor that produces less than 750 watts. State and local regulations, while seldom enforced, vary greatly. Check with your local authorities to see what the rules are. JUST LIKE A REGULAR BIKE – ONLY BETTER! A powerful, whisper-quiet motor delivers best in class acceleration and hill climbing. A lightweight, long lasting battery will take you anywhere you want to go – and back. Exclusive Pedalsense® technology gives you the freedom to ride how you want. Choose from over 15 models to find the perfect fit for you. Premium, name brand components from the ground up and an industry leading warranty. All Pedego Electric Bikes are governed at 20 MPH in accordance with federal and state regulations. Range varies between 15-60 mi. Depending on the battery, rider weight, terrain, weather, speed, and level of pedaling. The battery takes 2-6 hours to charge from a standard wall outlet. Your pedaling conserves the battery, but doesn’t charge it. Pedego owners actually get more exercise because it’s so much fun that they ride more than they ever would on a pedal-only bike.